August 10, 2014 at 4:04 pm	· Filed under Dance, Edinburgh International Festival, Folk, Music	·Tagged a capella, Edinburgh, EIF, gospel, isicathamiya, Ladysmith Black Mambaza, Mandela, mbube, South Africa, Zulus. 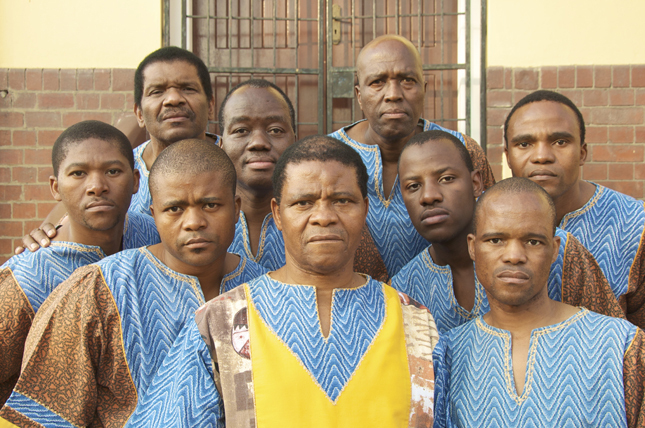 Best known for accompanying Paul Simon on his hugely successful 1986 album Graceland, this nine-man South African Zulu choir held their adoring fans in raptures with a moving range of haunting a capella harmonies expressing universal values and experiences. As you would expect, one of the songs – Long Walk to Freedom – was a tribute to the late ANC leader Nelson Mandela. However, most of the songs are related to the mundane things of everyday life; to encourage a young man taking cold feet before his wedding to go ahead with it and another extolling the virtues of mothers-in-law. One or two cultural differences did show up for the Edinburgh audience. The song Lovely Rain may go down well on the parched South African veldt and in the townships, but in Edinburgh? One thing Edinburgh has no shortage of in most years is rain. In fact a house less than a mile away was hit by lightning in a heavy thunderstorm the previous evening. The choir members interact well with the crowd, gently taking the rise out of one-another and, just before the break, with the audience too. What’s astonishing is that the performers bring out this extraordinary range of harmonisation without any accompanying musical instruments. It’s all done with the human voice alone. Once you see and hear this you’ll never forget it!